It is interesting that out face shape could tell a lot about our personality. In this article read what says the author of “The Wisdom of Your Face”, Jean Haner. She is face reading expert, and she explains that most people do not have distinct face shapes. Arguably, some people could have a mixture of square or round or oval whereas some do have a shape that you can clearly recognize. Although it may sound as a bluff, there is science behind it. In her book, Haner claims that she derived her various face reading techniques based on a 3,000 years old study on Chinese medicine. Not only does the shape of your face reveal your character, but also interestingly, your overall approach to life can be depicted. Your face is a map of your personality and as well as your whole life. 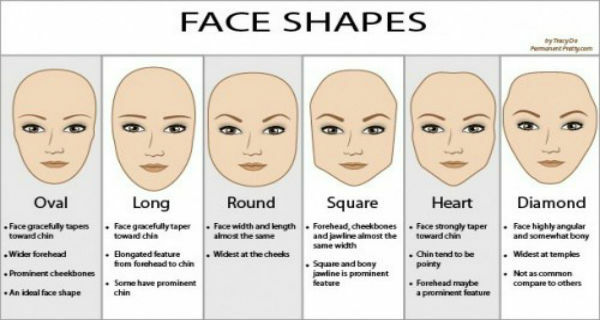 Below is a list of six kinds of face shapes and what they reveal. This type of face shape seemed to be somewhat elongated and stretched from the forehead to the chin. Some people with this shape have a notable prominent chin. In the book, this type of face, refers to someone who is very detail oriented and wants things done in their way. They also produce top quality work. They are also very precise with their words and communicate very well. However, they can be sharp with their words if you cross them in a wrong way. It is difficult to define your shape. For instance, you might think that you have a round face, because, I mean, doesn’t everyone think so? A detailed examination of the shape of your jaw and the widest parts of your face will assist you in determining the shape of your face. However, be careful not to be biased into forcing yourself a particular face shape having read this article. If possible, tell a neutral person to determine it for you. Features of oval shape are wider forehead with a jaw that is narrower than the cheekbones. The face tapers down towards the chin, leaving the cheek bones prominently visible. If you have this type of shape, than you always knows the right things to say in any situation, making someone feel at peace, comfortable and welcome. It is noted that sometimes they can be too focused on saying all the right things. What another person perceives about them is what matters to them. Haner in her book describes that both, men and women with this form tend to have a pointy chin. The face usually tapers toward the chin. The forehead tends to be broad and prominent. People with this face shape are said that possess an incredible inner strength. If they have a goal, they will pursue it. Their strength should not be confused for stamina; it is their inner power. They also have strong intuition and are very creative. They can be very pushy if they are determined. You can recognize this shape by that the width and length of this face are almost the same. Also, it is characterized by an extensive hairline. The face is widest at the cheeks. It is said that you are people’s person, generous and very kind. You also put the needs of other peoples first, often attracting narcissistic and end up not getting what you want from the relationship. Eventually, you will change when you realize that you are an over-giver, and stop making other a priority over your needs. The face shape is at times referred to as a Pear face shape. A triangle face is wide at the jaw-line and narrow on the forehead. The face seems to be highly angular and somehow bony. It is also not as common compared to others. The face shape means that the person usually wants to be in charge. The narrower the face is at the top, the more you want to be in control. Holders of this faces are often said to be successful. People with this face shape have a wider hairline and jaw line. The forehead, jawline, and cheekbones are almost of the same width. Square and bony jaw line is a prominent feature. Usually those people have a sharp wit and analytical mind. According to Haner, it typically refers to someone who is taking big projects since they have a lot of stamina.